A friend recently invited me for a delicious Afternoon Tea at Pennyhill Park, which is a beautiful country house hotel in Surrey. We had a really lovely afternoon drinking tea, eating cake and chatting; I started at the bottom of the three tier cake stand (sandwiches), worked through the middle tier (scones) and only gave up half way through the top tier (mini gateaux) after about twenty cups of tea. Had I realised they were going to give us a box to take the (few) remaining cakes with us I might have stopped a little earlier. All in the name of research, of course. 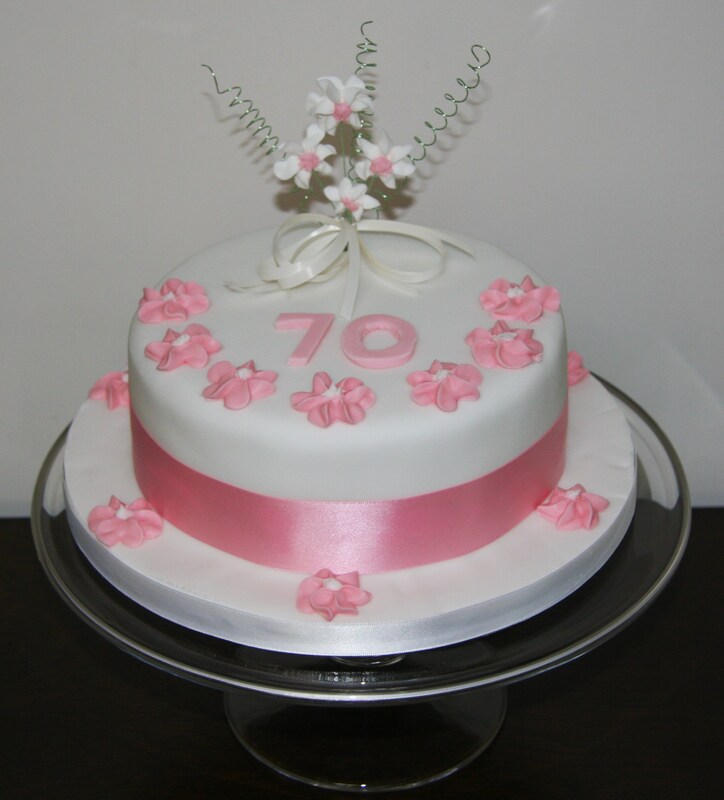 I had intended to get my friend some flowers to say thank you but when she mentioned her mother was having her 70th birthday and she wanted to get her a cake, I thought why say it with flowers when you can say it with cake? So I made her mother this three layer vanilla sponge, sandwiched with jam and buttercream and iced with sugarpaste. The flower decorations I made with royal icing and floristry wire and the 70 I cut out from sugarpaste; ribbon finished it off. So this cake really says Thank You as well as Happy Birthday! Thank you so special, cannot think of a nicer person to enjoy afternoon tea with and love the fact that we were researching. My mum absolutely loved the cake and could not remember the last time she had one so special on her birthday. It was shared with friends and colleagues at work who are now keen followers on your famous cakes. May I say a very big thank for my 70th Birthday cake. What a surprise. Cannot remember the last time I had such a super birthday cake. Apologies for delay in thank you we have been away for a few days. I’m really glad you enjoyed it; always good to do something for a good friend.